Morari Bapu, a famous religious preacher of Gujrat, appreciating the PM Modi, hit on the Congress. He asked with congress in the interrogating gesture, “if the tears dropped in remembrance of mother, what is wrong? Not only this, he told, “The congress is insensitive." 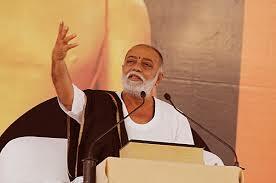 Morari Bapu told that the every talk have opposite reaction. Every talk has the instinct of hampering. They all are assuming stupid the people of country. There is no one gentleman.